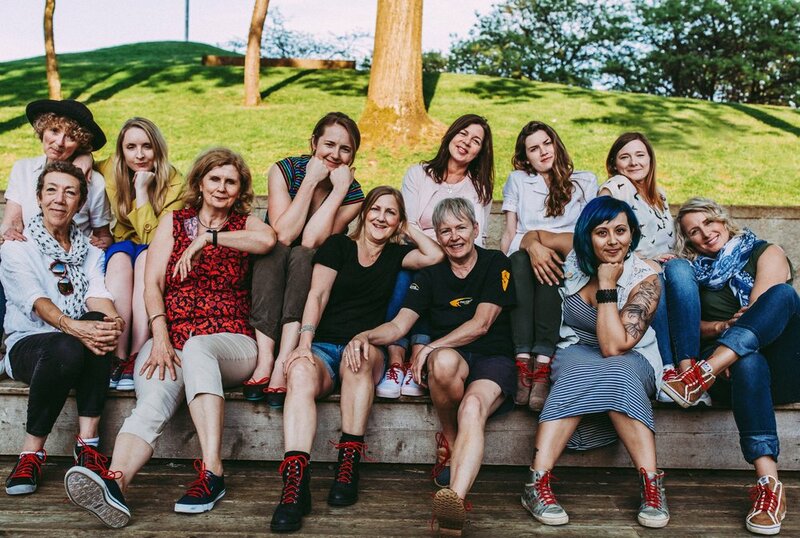 13 Feet off the Ground is a collective of established female artists based in Vancouver. The thirteen of us came together through an opportunity to participate in a residency program, 'Graniti Murales', in Sicily. We travelled to Graniti in October-November of 2017 where we created contemporary murals for the ancient exterior walls of the small town. Within our group we have a range of artistic styles represented; figurative, landscape, realism and abstraction. We expressed these styles through the creation of 11 individual murals, 1 installation and a collaborative mural. It was a very rewarding and fulfilling experience and the welcome and gratitude from our hosts and the villagers was very moving. Working together created a lifelong bond we hope will only strengthen as we look ahead to future opportunities. Click here to watch the wonderful video member Jenn Brisson made about our experience! Since then we have kept our momentum with several shows and presentations at the Lipont Centre, Port Moody Arts Centre, Harmony Arts Festival and Luppolo and Off the Rail Brewing companies. The group intends to continue to pursue other opportunities to work together locally and abroad participating in community based residencies and projects. Through our collaboration we hope to develop an engaging body of work that identifies us as both Canadian and as a Public Art Collective. We believe the mural work of our first residency in Graniti opens opportunity, at an international level, for future dialogue around our roles as female artists. Please follow us to enjoy our past experiences and future adventures as we post about our progress, exchanges and creations on this site.